This recipe is more usually served in the late summer and autumn months, but I’ve chosen it now because the weather outside today has carpeted the garden with a thick layer of snow. This is a classic dessert whose provenance stretches back centuries. Although the name ‘Apple Snow’ is the one more usually found in modern recipe books, it can also be found under the name Apple Fluff, Apple Souffle, Apple Puff and this version, Apple Cream Without Cream. This last was found in a manuscript from the 17th century, held by The Wellcome Library. The manuscript has been attributed to the splendidly named Mrs Deborah Haddock, who sounds as if she should be the twinkly-eyed star of stories set in a small, quaint fishing village. It is elegant in its simplicity, requiring only apple pulp, an egg-white and a little sugar. It is also, thanks to modern kitchen gadgetry, prepared incredibly swiftly, requiring less than ten minutes to come together before serving, once the initial preparation has been completed. This recipe can be made with any apple you have to hand, either keeping a purity of flavour with a single variety, or mixing and matching in a clearing-out-the-fruit-bowl, waste-not-want-not kind of way. One of the manuscript recipes I read recommended green apples as being the best, but failed to elaborate any identifying characteristics beyond colour. I prefer to use Bramley apples, for the pale insides and sharpness of taste. Other varieties you might like to try include Worcester Pearmains, which have dazzlingly white flesh that tastes faintly of lemon and rough-skinned Russets that have an almost nutty flavour. Alternatively, you could follow the recommendation in the recipe above and try this with gooseberries. This recipe tweaks the original slightly with additions found in other versions. In terms of quantity, it will make a visually impressive amount, but is so light and delicate, a full glass is still only a relatively small amount. It will hold its shape for two hours or so, but can be mounded in more impressive heights if served immediately after preparation. 5 Bramley apples, or apple of your choice. Peel, core and chop the apples finely. Toss them in the lemon juice as you go, to prevent them from discolouring. Add the apple and lemon juice to a saucepan with the sherry, if using. Cover and cook over medium-low heat until the apples soften and turn to froth. Mash the apples to a pulp, then sieve to remove all lumps. Chill until required. Whisk the egg-white until it will stand in soft peaks. Set aside. Put 250ml chilled apple pulp into a bowl and whisk on High for 2-3 minutes until pale and fluffy. Add the whisked egg-white and continue whisking, adding in the sugar one spoonful at a time. After 2-3 minutes the mixture will have both increased in volume and become dazzlingly white. Taste and whisk in more sugar if needed. Spoon or pipe into glasses and serve with some crisp biscuits on the side. If you have apple pulp spare, you could spoon a little of it into the glasses before adding the apple snow. A trip down my own personal memory lane this week, with a classic of the school dinner repertoire, Cornflake Tart. In the 1970s and 1980s, long before the advent of the dreaded turkey twizzler, my mother was a supervisor of a kitchen that cooked dinners for seven schools in the local area, including the one I attended, so I am perhaps more familiar than most with the full range of tasty, economical and wholesome home-cooking-style meals of that era. Whilst some dishes (spamspamspamspam) left me cold and some serving decisions (tinned tomatoes + cheese tart always = soggy tomato-juice pastry) lacking in thought, the desserts were almost (I’m looking at you, semolina-and-red-jam-blob) universally adored. I’ve written before about Gypsy Tart and Butterscotch Tart, and today we have to join them, the classic, even iconic, Cornflake Tart. I also want to take a few moments to discuss ingredients because, when they are this few in number, they can make or break a dish. By the same token, just because ingredients are humble, doesn’t mean that you should treat them carelessly, and that paying attention to the small details with the same care that more expensive ingredients might warrant, can reap rewards just as great with only a fraction of the cost. Cornflake Tart has four main ingredients: shortcrust pastry, jam, cornflakes and caramel. Shortcrust pastry. You can use any recipe you like, even buy ready-made if time is short, but I would like to strongly recommend my cornflour shortcrust for this particular tart, for a number of reasons. Regular shortcrust usually uses half butter and half lard as the fat in order to give the best texture and flavour, but this prevents it being enjoyed by vegetarians. My cornflour shortcrust is made with all butter, making it vegetarian-friendly, and the cornflour adds the crispness. You can make delicious gluten-free pastry by substituting Doves Farm gluten-free flour for the regular flour. I actually prefer the pastry in this recipe to be gluten-free, as the crumbly texture is fantastic against the sharp jam and sweet, crunchy cornflakes. Jam. You can use any kind of jam you have to hand, and strawberry seems to be a popular choice, but I recommend something sharp, to contrast with the sweetness of the caramelised cornflakes. Raspberry is good, as is blackberry (see photos), blackcurrant, cranberry, redcurrant, apricot or even apple butter. Also, it should be smooth and free from lumps, so warm and sieve/puree it before spreading onto the cooked pastry. This way you get the benefit of all the flavour and none of the distractions. Cornflakes. Surprisingly, regular cornflakes aren’t gluten-free, due to the barley malt used as a flavouring. On the plus side, gluten-free cornflakes are both available and practically indistinguishable from their mainstream counterparts. Caramel. I say caramel, but the addition of butter to the mixture pushes the sticky, golden glue that holds this tart together more towards a butterscotch than a true caramel. You can emphasize this even more by using soft brown or light muscovado sugar. Whatever sugar you choose, it is important to warm it slowly with the other ingredients until fully dissolved, so that the shine on your finished tart isn’t spoiled by visible sugar crystals. These quantities are sufficient for a medium-sized tart that will serve anything between 1 and 10 people, depending on appetite. Make the pastry: Put the flours and butter into the bowl of a food processor and blitz until the mixture resembles breadcrumbs. With the machine running, gradually add the cold water a tablespoon at a time until the mixture comes together in a ball. Tip the mixture onto a floured surface and knead smooth. Roll out thinly (5mm) and line a tart or flan tin lined with parchment. For the gluten-free pastry, roll it out onto parchment cut to size, then lift into the tin and shape the corners/edges with your fingertips. Cover with cling-film and chill in the freezer for 20 minutes. Remove the pastry from the freezer and prick the base with a fork to prevent blistering. Line the pastry with baking parchment and rice/baking beads. Bake for 15 minutes. Remove parchment and rice and bake for a further 5-10 minutes until pale but cooked. While the pastry is baking, make the caramel syrup. Put the sugar, butter and syrup into a small pan and heat gently, whilst stirring, until the sugar has dissolved. Pour the cornflakes into a large bowl. Allow the sugar mixture to simmer gently for 5 minutes then pour over the cornflakes and toss thoroughly to coat. When the pastry is baked, spread the warm jam over the base of the tart and add the cornflakes. Spread the cornflakes evenly over the tart and press lightly but not enough to crush the cereal. Return the tart to the oven for 10 minutes to ‘set’ the topping. Slice the cold tart into portions with a sharp knife and store in an airtight container. Switching out regular flour for Doves Farm gluten-free flour for pastry isn’t the only easy substitution you can make. Deliciously light and airy scones are just as easily made, using Mrs McNab’s 19th century recipe from Great British Bakes. One slight variation to the method is that, due to the lack of gluten, there is a tendency for the dough to spread during baking. So to keep your gluten-free scones neat and for maximum lift, bake them in baking rings. If you don’t have baking rings, then do as I do and use the tins from small cans of mushy peas. Preheat the oven to 220°C, 200°C Fan. Grease 8 small baking rings/tins and line with parchment paper. Arrange the tins on a parchment-lined baking sheet. Put the flour, cream of tartar, bicarbonate of soda, salt, butter and egg into the bowl of a food processor and blitz until the mixture resembles breadcrumbs. Tip the mixture into a bowl. Mix together the yogurt and milk. Gradually stir the liquid into the dry ingredients. You might not need it all, but the mixture should be soft and moist rather than dry. Divide the mixture between the tins. Each one should have about 55g of dough. Brush the tops with milk and bake for 15 minutes, turning the baking sheet around after 10 minutes to ensure even baking. When baked, if the tops are a little pale, if possible, switch the oven to top heat with fan, remove the rings/tins and brown the scones for 3-4 minutes. If your oven doesn’t have this function, then brown lightly under a grill but don’t leave them too long or they will burn. This recipe is for a traditional steamed sponge, the type many of us remember from our childhoods. So comforting in the winter months, with a blanket of hot custard draped over. They are a breeze to mix, but in these days when most people have a gas or electric stove-top, rather than an always-on range, the three-hour steaming time makes the cooking something of a marathon. To make things easier for everyone, I’ve scaled this recipe down to make four individual puddings which can be cooked in a steamer pan over simmering water. Not only are mini puddings delightfully small and perfectly formed, they take a mere 30 minutes to steam. This means that they can be put on to cook as everyone sits down to the meal, and be ready by the time the main course is done and cleared away. As if this weren’t cause enough to rejoice, this recipe can also be easily and infinitely adapted with different ingredients and flavours, even to the point of producing four differently-flavoured puddings from the one mixture. A few suggestions are included below, but do please experiment with your own creations too! The base instructions are for a plain sponge. Bring a pan of water to a simmer. Put the butter, flour, salt, sugar and baking powder into the bowl of a food processor and blitz until the mixture resembles breadcrumbs. Tip out into a bowl. Whisk the egg and vanilla with the milk and stir into the dry ingredients until smooth. Generously butter four individual pudding bowls and divide the mixture evenly amongst the prepared bowls. Cut four squares of foil for the lids and make a single pleat in the middle. This will allow the sponge mixture to expand during cooking without forcing the foil cover off. Butter the inside surface of the foil, then fold over and around the pudding bowls. Arrange the four bowls in the steamer pan, cover with a lid and place over the simmering water. Peel off the foil and run a knife around the side of the puddings to loosen them. Turn out the puddings and serve with cream, custard or pudding sauce of your choice. These tweaks can be made to the basic vanilla sponge. Jam Sponge – put a tablespoon of your favourite jam into the bottom of the pudding bowls before adding the sponge mixture. Have some of the jam warmed for serving. Fruit Sponge – put 2 tablespoons of cooked fruit into the bottom of the pudding bowls before adding the sponge mixture. Again, have extra fruit to hand when serving. Raisin decoration – dot large colourful raisins onto the sides of the buttered moulds before adding the plain sponge mixture. Raisin sponge – Add 60g raisins to the plain mixture. You can also ornament the sides of the bowls as above. Coconut sponge – add 60g dessicated coconut to the sponge mixture. Stick more coconut to the butter in the moulds before adding the sponge mixture. Citrus sponge – omit the vanilla flavouring, add the grated zest of a lemon/orange/lime to the sponge mixture, together with the juice. Use a little less milk to mix. Add 60g of diced, candied peel of the same flavour if liked. Candied fruit sponge – use 60g of candied fruit such as cherries, cranberries, pineapple, either on their own or mixed. The following tweaks should be done by altering the method slightly and using the creaming method for the sponge (creaming butter and sugar, then eggs then dry ingredients), as the darker colour of the sponge sometimes highlights butter pieces that have not fully combined with the other ingredients. Dried fruit pudding with toffee top. Use brown sugar to mix the sponge and add 60g of chopped figs, dates or prunes to the sponge mixture. Mix 30g of softened butter and 30g of soft, dark brown sugar and divide amongst the bowls before adding the sponge mixture. Double jam sponge – Omit the vanilla, before adding the milk and egg, stir 3 tablespoons of jam into the sponge mixture. Add 1 tablespoon of jam to the bottom of each of the pudding bowls. Chocolate sponge – Add 2 tablespoons of cocoa to the mixture and use a little more milk to mix. Add 60g chocolate chips to the mixture, or put them in the bottom of each pudding mould to form a chocolate ‘cap’. Alternately, half fill the moulds then add the chocolate chips in a well, and cover with more sponge mixture. This will make for a molten centre once cooked. Coffee and Walnut sponge – Omit the vanilla, add a tablespoon of espresso powder or coffee essence to the sponge mixture and stir through 60g chopped walnuts. Put a half-walnut upside down in the bottom of each basin before adding the sponge mixture. The pudding cake is, to my perception, a genre of puddings that has all but disappeared from our tables, despite being popular since the 18th century. It describes something that, when cold, would be recognisable as a cake, but here it is served, warm and comforting, straight from the oven. As with the Fruit Sponge, it’s the hugely enjoyable lure of warm sponge with cream or custard that is the main draw. The flavourings for this recipe are only limited by your imagination – you can use any combination of fruit/nuts/candied peel that takes your fancy. For this base recipe I have opted for the unjustly unglamorous prune for the wonderfully rich dark, almost toffee flavour the fruit develops during cooking. Double cream or custard to serve. Quarter the prunes and put them in a small pan. Pour over the fruit juice and put over medium heat. When the mixture boils, cover and turn off the heat and leave to stew for 30 minutes. Preheat the oven to 180°C/160°C fan/gas 4. Grease and line a 24cm, springform tin with parchment paper. Put the eggs, milk, butter, sugar baking powder and flour into a bowl and mix thoroughly until it comes together into a smooth cake batter. If it seems a little heavy, mix in some additional milk until it achieves a dropping consistency and falls easily from the spoon. Spoon a quarter of the batter into the prepared tin and scatter half of the soaked prunes over. Add another layer of cake batter and sprinkle over the nuts. Spoon in half the remaining batter and sprinkle the rest of the prunes. Pour the rest of the batter into the tin and smooth over. Bake for 40-50 minutes, until the cake is risen and golden. Allow to cool in the tin for ten minutes before removing and transferring to a warmed serving dish or plate. Serve in wedges with double cream or custard poured over. Pudding pies used to be immensely popular in the 18th century, and describe a particular style of dish where a pastry case is filled with a thick, flavoured and sweetened porridge and the two baked together. Obviously, you’re now saying to yourself, ‘Hang on a second, that’s a tart, not a pie’, and you’d be quite right, of course, but only by 21st century semantics. In addition, the ‘pudding’ of the title is to our modern eyes, rather vague, but to those of an 18th century cook, it was curiously specific, and not for the reason you might think. Look up the word ‘pudding’ in the Oxford English dictionary, and the very first definition is: A stuffed entrail or sausage, and related senses. Yes, no mention of warm, comforting delicacies served at the conclusion of a meal, but innards and stuff in ’em! 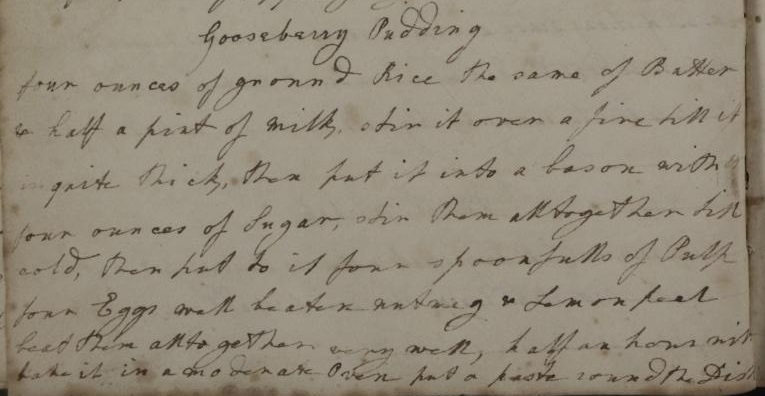 In the 17th and 18th centuries, pudding could be sweet or savoury. Echoes of these savoury puddings are still visible today in the black and white puddings sold in butchers shops. Sweet puddings included dense mixtures of dried fruits, peel, suet and spices, either stuffed into entrails or wrapped in floured cloths and simmered in water, as the traditional Clootie Dumplings of Scotland are today. A more accurate description of pudding from these times would be that of a foodstuff of a certain texture, and so it is with pudding pies. The texture is more akin to a baked cheesecake, smooth and dense, but with just a fraction of the richness, they’re practically health food! In this instance, the filling is flavoured with the sharpness of gooseberries. I like the way it cuts through the denseness and really lifts and brightens the filling, but any smooth fruit puree will work well, the best results coming from sharply acidic fruit. Stir the ground rice, butter and milk over heat until quite thick, then pour into a basin. Add the sugar and stir together until cold. Add the gooseberry pulp, well-beaten eggs, lemon and nutmeg. Spoon the mixture into the pastry-lined dishes and smooth over. Put the tarts onto a baking sheet and cover lightly with a sheet of foil, to prevent the filling darkening too much. Bake for 20-30 minutes, depending on the size and shape of your pie dishes. Remove the foil after 15 minutes and turn the pie dishes around if they seem to be colouring unevenly. Serve warm or cold with cream or custard. There’s a 200-year-old tradition in Oldbury-on-Severn of making gooseberry pies with a sweetened hot water crust pastry as part of the Whitsun celebrations. Jane Grigson mentions them in several of her writings on English food. Due to the age of the recipe, it was some time before I managed to find a picture of these iconic tarts, and for a long time had to rely solely on my imagination. Consequently, what I pictured in my mind was the pie you see above, and was just a little disappointed to eventually learn that the pies were small, hand-sized, shallow, round pies with a single layer of gooseberries and a lot of sweet/sharp juice. The use of a hot water crust for a fruit pie is unusual, and can be tricky to work with. Some recipes even recommend that once the tart shell has been formed, the pastry is chilled overnight in order to make a firm casing for the gooseberries, but this then makes it difficult to attach the lid firmly once the paste is cold. In my searching, I also found accounts that seemed to agree on two things: everyone seemed to like these tarts, even if they didn’t like gooseberries, and that they were extremely juicy when bitten into. I decided to make a large, consumer-friendly variation of this classic dessert pie by setting the juice with gelatine, so that it could be sliced and each slice would hold its shape. Elderflower is a classic flavour pairing with gooseberries, and this pie combines a jelly made from the gooseberry juice syrup and elderflower cordial with fresh gooseberries and a sweetened hot water crust. The jelly is sweet and delicately flavoured and the gooseberries are so sharp, the contrast between the two is both delicious and refreshing. To make everything much easier, it is baked in a loaf tin. Put the fats, sugar and water into a pan and warm over a low heat just until the fat has melted. Put the flour into a bowl and pour on the warmed liquid. Stir well. The paste will be very soft when it comes together, and you can roll it out if you like, but it can also just be flattened and pressed into the tin by hand. Use a sharp knife to top-and-tail the gooseberries, removing the stalk and the calyx. Generously grease a large loaf tin. You can, of course, make this in any shaped tin, but a rectangular loaf tin does produce pretty and regular slices. In order to decide what size of tin to use just tip in your prepared gooseberries. The best fit will be from the tin the gooseberries only just fill. If liked, line the tin with baking parchment in order to help with the removal of the pie once it has cooled. Make the pastry and divide into two. Roll out one piece and cut a lid for your pie. Use the empty tin to mark out its size, then cut the pastry 3cm larger all the way round. Set aside. Gather the trimmings and the rest of the pastry together and roll out to about 1cm. Line your greased loaf tin and allow the excess pastry to drape over the sides for now. Make sure any cracks are well patched, so that the juice stays inside the pie. Layer the gooseberries in the lined tin with the sugar. Moisten the edges of the pastry with water and place the pastry lid on top of the pie. Press the edges together and trim the excess. Crimp the edges in a decorative manner. Cut three circular vent holes in the lid at least 2cm in diameter. Use the pastry trimmings to make additional decorations if liked. Cover lightly with cling film and chill in the fridge for 1 hour to firm up. Preheat the oven to 200°C/180°C fan/gas 6. Brush the lid of the pie with beaten egg and bake for 45 minutes to 1 hour, until the top is crisp and golden and the sides are well-baked. It is better to cook the pie a little longer than for the pie to be under-baked, so if the top is becoming too dark, cover with some foil. When you’re happy with the done-ness of the pastry, remove the pie from the oven and set aside to cool for 10 minutes. Put your pie onto a wire cooling rack. Put a second rack upside-down on top of your pie. Place a large bowl on your work surface. If you think it necessary, place a damp teatowel underneath to prevent slippage. With your thumbs uppermost, pick up your pie tin, sandwiched between the wire racks. Holding the pie tin over the bowl, flip it towards you and let all of the juice drain out of the pie through the vent holes. Once the juice has topped dripping, turn your pie the right way up and set aside. Taste the syrup and add sufficient elderflower cordial to flavour. Since the pie will be eaten cold, you can make the flavouring slightly stronger than usual, since the flavours will be somewhat muted when served. When you’re happy with the taste, measure the volume of syrup. For every 150ml, you need to bloom (soak in water) 1 leaf (sheet) of gelatine. Once bloomed, drain and add the gelatine to the syrup and warm gently until melted. Pour the syrup/gelatine mixture back into the pie. You want enough syrup in the pie to make the cooked gooseberries float. Leave your pie to cool. Cover with plastic wrap and chill overnight in the fridge. Allow to come to room temperature before removing from the tin and cutting in slices to serve. Of all the puddings of my childhood, this is the one that I return to the most. There is something just so comforting and delicious in the simplicity of sweet sponge, sharp fruit and cold cream. It’s so simple it doesn’t even have a proper name, just a terse description of the ingredients; fruit, sponge. But that simplicity in no way detracts from it’s appeal. Like all good recipes, it is incredibly versatile and can be used with almost any fruit you have to hand, although my recommendation is for sharper fruits to highlight the contrast with the other elements. If you have some prepared fruit to hand, it can be brought together in a reassuringly short space of time. Popped in the oven as you sit down to a meal, it will be ready by the time the plates are cleared. Alternatively and indulgently, you can sit hunched in front of the oven door, spoon in hand, watching it’s progress in anticipatory delight for a brief half hour. Stir the fruit purees together and pour into an oven-proof dish. Smooth over. Put the egg, softened butter, sugar, flour and baking powder into a bowl and mix thoroughly to a smooth batter. Gradually stir in a little milk until the mixture achieves dropping consistency – when a dollop of batter drops easily from a spoon. Pour the batter over the fruit and smooth the surface. Bake for 35-40 minutes until the sponge is risen and golden. Remove from the oven and sprinkle with a little caster sugar. Serve with chilled double cream.